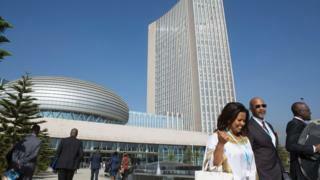 China has dismissed reports it bugged the African Union (AU) headquarters as "preposterous". Kuang Weilin, the Chinese ambassador to the AU, told reporters in Ethiopia the "absurd" claim in France's Le Monde was "very difficult to understand". But Mr Kuang - who hailed the headquarters as a "monument" to his country's relationship with the continent - said it was entirely untrue. "I really question its intention," he told reporters on Monday. "I think it will undermine and send a very negative message to people. I think it is not good for the image of the newspaper itself.